Staffan Larsson and Lars Borin, eds. This volume is dedicated to Robin Cooper on the occasion of his 65th birthday. 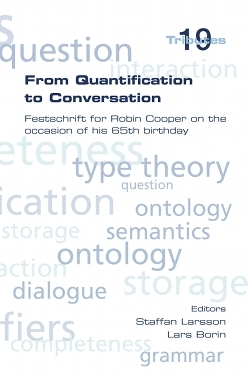 The honoree's contributions to formal linguistics and language technology range from quantifier storage techniques and generalised quantifiers to the development of foundations and applications of a type-theoretical framework for formal semantics and pragmatics of natural language, with a focus on linguistic interaction in conversation. In this book the reader will find brilliant contributions of prominent linguists, computer scientists and philosophers which ranges over a broad repertoire of topics related to the outstanding work of Robin Cooper.